Heavy showers will cover Scotland, Wales, northern England and Northern Ireland throughout tonight, bringing cloud and keeping temperatures mild. 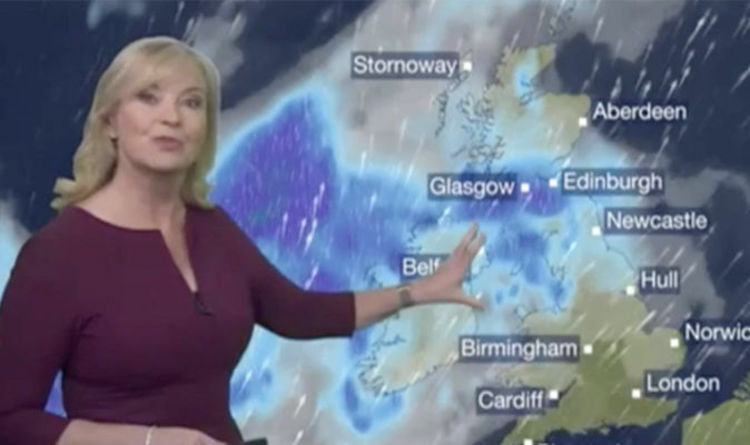 BBC Weather presenter Carol Kirkwood said: “So you can see the cloud coming in across western Scotland and also into Northern Ireland. “That is heralding the arrival of our next weather system, bringing in this rain. Now the rain will be persistent and heavy in places throughout the night, across Scotland, Wales, northern England and also Northern Ireland. “To the south of that, we’re looking at a dry night with clear skies but look at those temperatures, look at the contrast, 11C towards the west, 10C towards the south and 7C as we push towards the east. Despite the arrival of this wet weather system, it will be a fairly dry start to the day. Ms Kirkwood said: “What we have is a lot of dry weather, still do have some heavy showers in the west but as we go through the course of the day many of those will start to fade and we are looking at a fair bit of sunshine. “Now this is the front that brought all the heavy showers yesterday, it’s clearing away will leave a few residual showers, you can tell from the isobars it’s going to be another breezy day. ”For most of us it’s going to be dry, it’s going to be sunny and it’s going to be breezy, particularly around any showers. The Met Office forecast dry and baking conditions intensifying into the afternoon, at the cost of a return to grey swollen skies tomorrow. She continued: “Yesterday’s low pressure has slowly inched its way eastwards out into the North sea, leaving a ridge of high pressure temporarily across the country for today. “This morning there is plenty of sunshine around for England and Wales - one or two showers, though as we head further north cloudier skies and a rash of showers across many part of northern England and western Scotland.